Same combined benefits as above for FOUR months of programs! 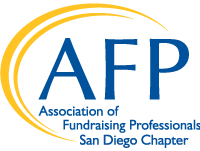 AFP - San Diego Chapter is a member of the worldwide Association of Fundraising Professionals - (AFP). AFP advances philanthropy by empowering people and organizations to practice effective and ethical fundraising. The San Diego Chapter fulfills its mission through education and training, promoting credentialing, providing resources, networking, mentoring, advocacy and recognition.